Diablo III's final release date of May 15, 2012 was announced two months beforehand, on March 15, 2012.. This date came after years of development and numerous delays, which pushed the game from Q4 2011 back to Q1 2012, and finally Q2 2012 when the release came at last. Though the game took longer than expected, there was never any official date until the official May 15, 2012 date, which was achieved. All previous dates were estimates by retailers or media and were unofficial, though the developers did offer several "release windows" such as "the second half of 2011" that they were aiming for all during the previous year. As with all hotly-awaited Blizzard games, there were years of news and rumors about when Diablo 3 would finally see the light of day. News items related to Diablo 3's release date. Screenshot gallery of (incorrect) estimated release dates. Diablo 3 projection: Fourth Quarter 2011? The image to the right "leaked" via a Chinese MMORPG site in late 2010. . It's alleged to be an internal Blizzard document from April 2010, listing estimated dates for their upcoming product releases. Diablo 3 was listed for the fourth quarter 2011, a fact that gave many fans a huge burst of excitement, and then eventual dismay when that date was postponed. With Diablo 3 targeted at being launched this year, we plan on testing the game in the third quarter. 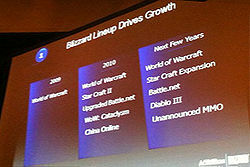 The chart got another excellent piece of supporting evidence in November 2010, when Blizzard confirmed that Titan (named in the chart) was the codename for their unannounced but well-known secret next-gen MMORPG . The project had long since been known about, but the code name "Titan" was brand new news when the chart was released. 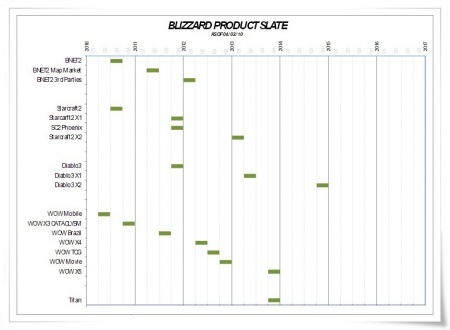 The final piece of evidence appeared in February 2011, when Japanese and Brazilian localizations were added to Blizzard's upcoming WoW patch  "WoW Brazil" is listed on the chart for mid-2011, so they seem to be right on schedule for that. The first Diablo 3 expansion, Reaper of Souls, was teased by Blizzard with a splash screen on August 13, 2013, with official details and confirmation set for August 21st, 2013 at the Gamescom convention. Prior to the reveal, fans and Blizzard always treated the expansion as a fait accompli, with only the content and date remaining to be determined. This impression was strengthened by the leaked product schedule which showed two expansions planned for release, 18 and 36 months after the initial game. As usual for Blizzard the initial estimate proved optimistic and the first expansion wasn't announced until 15 months after release. No official release date has yet been offered. Unofficial official guess the D3X release date pool, with prizes for the winner. During Diablo 3's development fans constantly clamored for progress reports. Blizzard offered them regularly, but without any publicly-released dates or percentages. Even more than most game developers, Blizzard hates to give any sort of percent completion, since they so often iterate and reiterate (and de-iterate, some fans complain) and this makes progress hard to quantify with development, testing, and polishing all going on simultaneously. We have weekly playtests to focus feedback on areas and features. Last week was an Act III dungeon. ...The game isn’t being developed in a linear fashion so us saying we’re working on things in Act III doesn’t really mean anything in regards to how much of the game is finished. Since we’re constantly evolving the tools and processes for creating the various assets for the game (and just plain getting better at it), it’s best to have as wide a perspective as possible. Otherwise we’d probably paint ourselves into a corner. All of the work being produced at the end of the game would look far and above better than the stuff that was produced at the beginning, and so we’d probably have to go back and redo a lot of that work. Almost since the game was announced in June 2008, the developers have said that they were well into content production. (Meaning that the engine and basic game functions were all locked down and working properly.) Content though, especially in Blizzard titles, is such a huge area of work that experienced Blizzard-watchers expected the content production and balancing would take years. And it has. D3 in "Next Few Years"
"“Soon” Was Too Soon — Diablo III to Arrive in Early 2012. After quickly taking the statement down Blizzard put it back online later that day, probably realising it was futile to shut the barn doors once the horse had bolted. We have implemented changes which will greatly improve the game experience and final release will live up to the highest expectations. We expect launch to be a big opportunity for Blizzard. More details will be announced in the coming weeks. The Diablo 3 Team regularly referred to a future beta test, but did not absolutely confirm it until Blizzcon 2010 . The Diablo 3 Beta test began in early September, 2011, and was initially limited to "Friends & Family" testing. The closed beta began in mid-September 2011 and contained the same content as the Friends and Family testers were testing. Blizzard beta tests generally last 4-6 months, and Jay Wilson estimated that Diablo 3 would be released about six months after its beta test begins. This did not happen and the Diablo 3 beta was extended several times as the release date was backed up from late 2011 to Q1 2012 and then finally Q2 2012. See the Diablo 3 Beta article for much more on this issue. After years of offering release date estimates for various games, most of which they missed, Blizzard has grown quite conservative about offering release dates. They now give only vague release date windows, and never any specific dates or targets unless they are very sure they can meet them. Geoffkeighley (via Twitter): someone has to ask this: When is the Diablo 3 beta gonna be? Jay Wilson: Probably about six months before we release. One commonly-cited release date prediction has been the fact that no Blizzard games have (yet) been released much more than three years after they were first announced. The developer is aware of this ever-lengthening cycle and they seem keen to correct it, and have made various comments about not announcing any upcoming projects (such as Titan) until the games are much closer to finished. Thousands of fans took a guess at the release date in an unofficial release date prediction pool on Diablo IncGamers. The thread was started up when Diablo 3 was announced in June 2008, and became amusing and painful to view over the years, as hundreds of estimates went weeks, months, and then years by the wayside. We're definitely looking into having a trial version available at some point, as we do for World of Warcraft and StarCraft II. We'll probably make a trial edition at some point. It's sort of a demo I suppose, but it's a bit better because it's essentially the full game just with locks put on certain areas. So you'd be able to jump into multiplayer games with your friends, but maybe you wouldn't be able to play beyond a certain place and wouldn't have access to all the game systems (certainly not auction houses) but if you choose to buy the game all that stuff just unlocks. See the Diablo 3 Demo article for more details about playable Diablo 3 demos. Images related to the Diablo 3 release date. Fye's very wrong January 2010 estimate. Swedish Gameshop: December 31, 2010. GameStop's in-store estimate: March 1, 2011. Wal-Mart.com's estimate: March 1, 2011. Fan made fake screen of a digital download page on Battle.net. June 28, 2012 date. Past date information, now rendered obsolete by the passage of time but it's hear for posterity. In Activision/Blizzard financial reports, two games are reported as being released this year: Starcraft II and World of Warcraft: Cataclysm. Diablo 3 was never part of Blizzard's release schedule for 2010. There were some rumors in 2008  that Diablo 3 was further along in the development cycle than Starcraft 2. Blizzard immediately denied that, they always said Starcraft 2 would be released first, and it was, on July 27, 2010. With Diablo 3 still nowhere near beta testing at that point, that's as thorough a rumor debunking as you're ever going to see. This page was last edited on 15 August 2013, at 23:48.